146 pages | 1 B/W Illus. Publisher’s Note, Foreword - Professor Arthur Stockwin, Foreword - Sam Atherton, Dedication and Acknowledgements - Sam Atherton, Preface - Peter Berton, Acknowledgements - Peter Berton, Explanatory Notes, Part I: History and Organization, Chapter 1: Brief History, Chapter 2: The Party, Part II: Ideology and Politics, Chapter 3: Ideological Adaptation, Chapter 4: Electoral Record, Part III: International Relations, Chapter 5: Relations with Moscow through the Summit of 1979, Chapter 6: Relations with Moscow after the Summit of 1979, Chapter 7: Relations with Beijing, Chapter 8: Relations with other Communist Parties and Diplomatic Activity, Chapter 9: Conclusions, Prognosis, and Evaluations, Index. 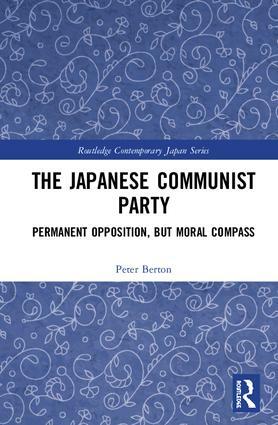 Peter Berton was a Professor of International Relations at the University of Southern California. Sam Atherton is a Professor of Business Administration at Mount San Antonio College in Walnut, California.